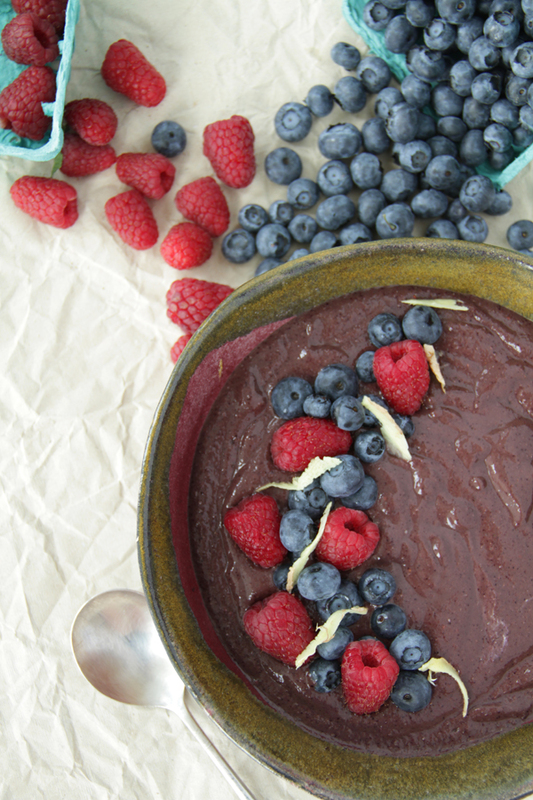 This smoothie bowl is filling yet low in calories and chalk full of nutrients. Berries offer extraordinary amounts of antioxidants, such as Vitamin A and C.
It’s also got a solid dose of greens (think iron, folic acid, and protein) from the kale and chlorella and prunes (lots of deep, dark, iron-rich goodies!) 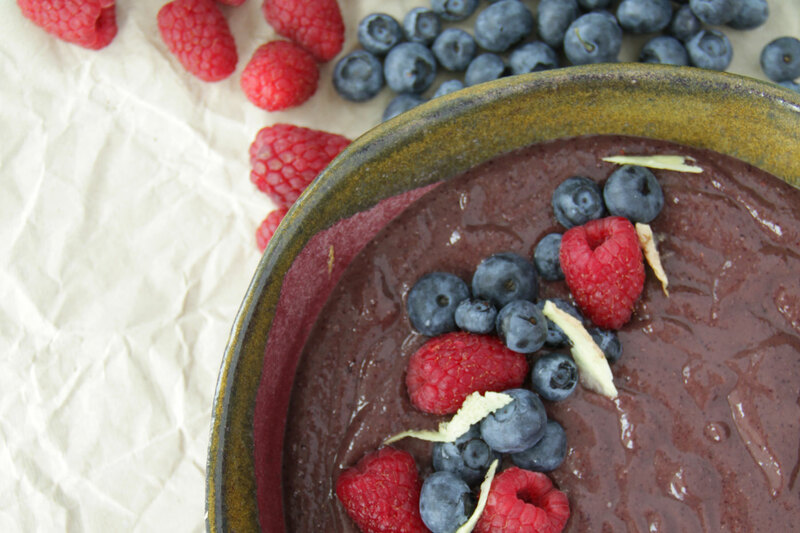 plus lemon for a vitamin C boost – since we can’t absorb iron from plants unless we have a little help from vitamin C.
Finally adding the ginger will increase the anti-inflammatory properties of this smoothie bowl as well as aid in digestion and help the body with detoxification. This blend is also high in calcium, protein, and fiber, which makes it very filling. Blueberries, strawberries, raspberries, cranberries and blackberries are known as some of the world’s best dietary sources of antioxidants, which helps keep free radicals in check and fights inflammation. Berries come with lots of fiber, including insoluble fiber, which slows the rate at which food moves through your colon and in turn helps control hunger. Chlorella is a green algae highly prized and well researched in Japan. Chlorella is rich in chlorophyll, containing 3 to 5 percent chlorophyll, highest of the microalgae and significantly more than any leafy green vegetable! The high levels of chlorophyll in chlorella help to cleanse the bowels and liver, sweeping the blood clean of toxins, and ensuring clear skin. Like spirulina, chlorella gently stimulates underactive bowels and increases waste while enhancing the lactobacillus flora necessary for bowel health. It is also thought to boost the immune system and help fight infection. It is also used to treat constipation, fibromyalgia, high blood pressure and high cholesterol. Chlorella has been used to treat cancer and also help protect the body from the effects of cancer radiation treatment. 1/4 organic lemon including the peel! 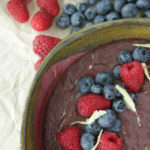 Combine all the ingredients in a high-speed blender and blend until smooth. If your blender has a stirring device to use while it's blending, use it to help move things around. If it doesn't, you may need to stop and scrape the sides with a spatula periodically. 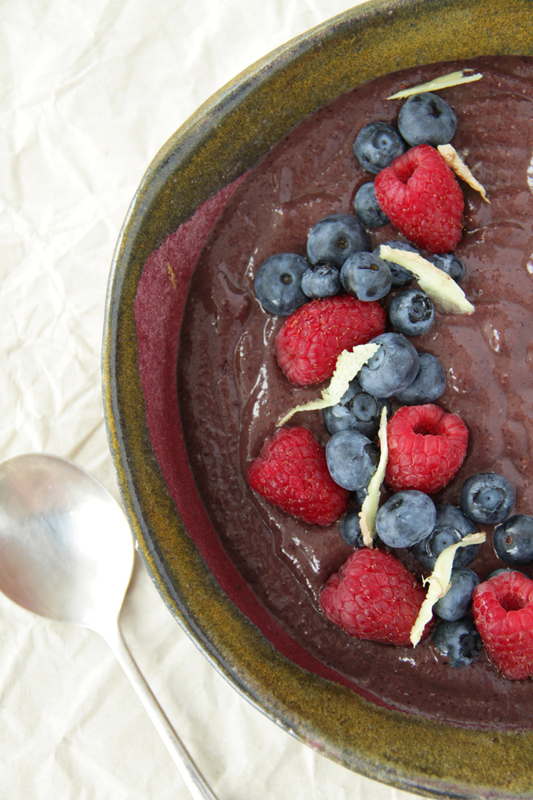 Pour into a bowl and add your toppings of choice – we topped ours with fresh berries and sliced fresh ginger.